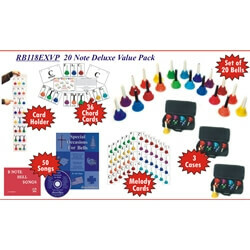 This excellent value will give you everything you need to get started using these popular, fun and eduational products. Includes a full set of 20 bells (RB108, RB108C & RB108EX). Three padded cases will allow you to store the three components of your 20 note set separately. The RB7014 Book - 8 Note Bell songs, includes melodies that can be played with the RB108 set included in this package. For your very youngest bell ringers, many of the songs in this book can be conducted using the melody cards included in this package. Also included are a set of 36 cards for directing chords and a card holder which holds up to 8 of the cards. The "8 Note Bell Songs" Book and the "Special Occasion for Bells" Book include the chord symbols, allowing you to have the bell ringers play the chords in a tremolo style. The set of 36 chord cards includes all 12 major, minor and dominant chords, allowing you to use the chord method with all of the songs in both books as well as many of your own song choices. The "Special Occasions for Bells" package also includes a CD accompaniment which can be used as accompanimnet for playing both melody and chord styles. When completing your purchase plan, remmber that the songs will almost never use all of the bells. If you want all of your ringers to be playing each song, you will want to purchase additional sets of bells. If you plan to do mostly chord style playing, the RB118 set (RB108 & RB108C together) will be a nice add on. For melody playing, you may want to purchase extra RB118EX (RB108, RB108C and RB108EX together). If you plan to start mostly with simple songs and expand to the others later, you may want to purchase additional RB108 sets alone. Complete product list: (1) RB118EX Bell Set, (3) RB108CASE Bell Cases, (1) SP2390 Card Set, (1) SP2392 Book/CD, (1) LRCH8 Card Holder, (1) LRMC96 Card Set, (1) RB7014 Book.